Born in 1982 in Johannesburg, South Africa, where he lives and works. Lawrence Lemaona’s work is based on the analysis of the role of the media in South Africa. The artist questions the reality of their power: are the media a didactic tool or an instrument of propaganda? Borrowing the language and the power and significance of slogans, he embroiders satirical texts on pieces of traditional cloth. 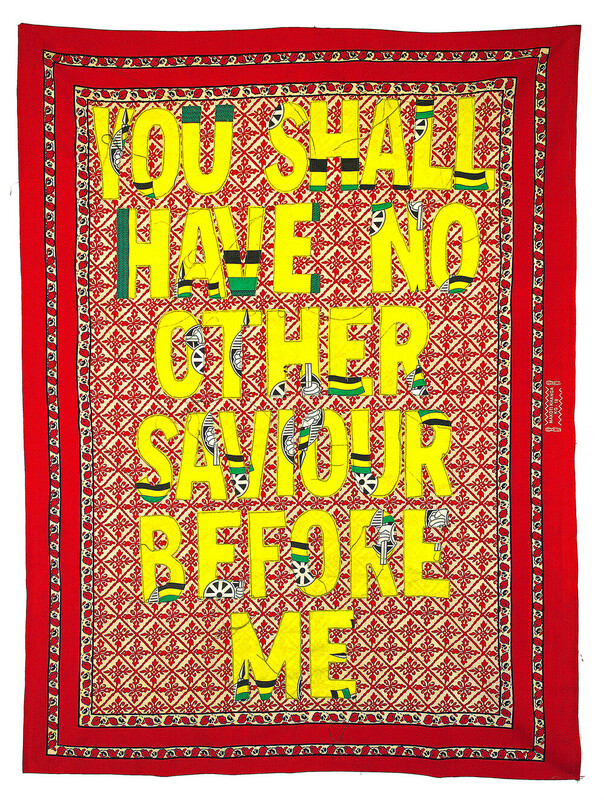 Using Kanga fabrics, that relay historical references and spiritual connotations, the artist reinforces the critical and transgressive impact of his visually attractive work. Through sarcasm and humor, he exposes the standards imposed by the media and reveals their impact on people’s psyche and daily lives. In 2009, he participated in Beauty and Pleasure in South African Contemporary Art at the Stenersenmuseet in Oslo. His work was shown in the collective exhibition My Joburg at the Maison Rouge – Fondation Antoine de Galbert in Paris in 2013. He has been the recipient of several awards including the Absa L’Atelier Gerard Sekoto award in 2005 for the most promising artist. At present he is a lecturer at the University of South Africa (UNISA) in Pretoria, South Africa. For The Day That Comes an original work will be presented.